Watergarden Inn at the Bay is a colorful haven in the middle of vibrant St. Petersburg. More boutique inn than typical bed and breakfast, our 14 unique rooms and suites range from cozy queen rooms to spacious two room king suites. Feather beds and whirlpool tubs? You bet. A pool- yes please- with water spouts! 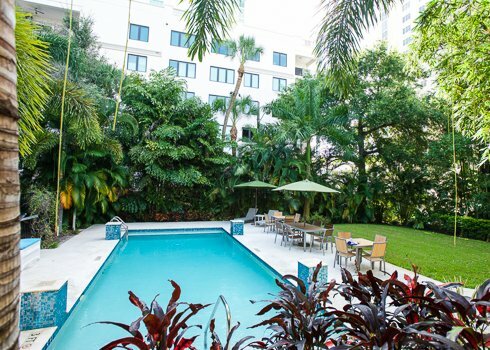 Take a dip or simply relax in our lush garden area. Have a glass of wine on our back patio or upper deck. Picture an intimate outdoor wedding on the garden lawn - beautiful. And did we mention this is all right downtown? No doilies here. Instead, contemporary furnishings blended with fine antiques, on-site parking, flat screen TVs and Keurig coffee makers in each room. WIFI everywhere. Breakfast is available whenever you want it, 8:00-10:30 AM. Have as much or as little as you want; eat indoors or out by the pool. We offer a continental buffet with tempting baked goods, fresh fruit, juice, cereals, yogurt and other goodies. We’ll make you an awesome cappuccino. Stay for a night or a week, on your own or with a gang. We hope to see you soon!